MULO MUTO is a 2 headed monster created and (un)directed by Joel Gilardini (treated guitars, loops, noises) and Attila Folklor (synths, noises, loops and percussions). MULO MUTO is a ritual trip inside your worst nightmares and an impredictable mix of doomed noises. Beware the monsters, beware yourself! Mulo Muto (MM) was created by two passioned music makers who originally met in Zurich (Switzerland) in 2012. Both come from the Italian speaking part of the country but followed very different musical paths. Joel Gilardini is a guitar player and an explorer. Before starting MM he created The Land Of The Snow (avantgarde metal), played with Lunatic Fringe (avantgarde jazz) and started to open as a solo‐performer for Nik Bärtsch’s Ronin (ECM) on regular basis at Exil (a well-known Zurich’s club). 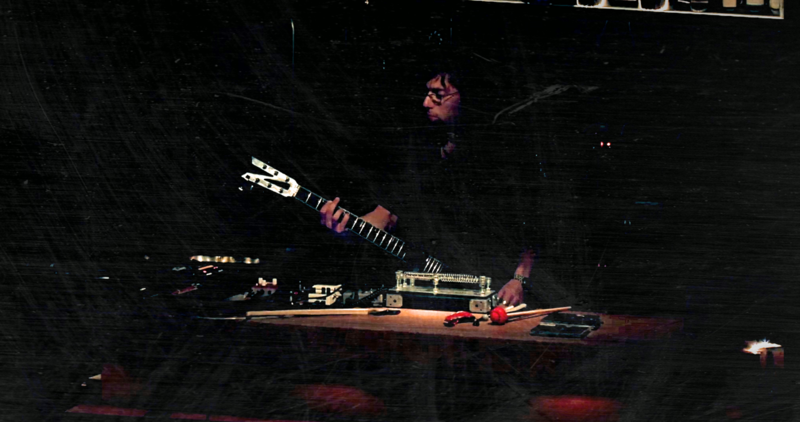 Attila Folklor followed other paths starting with punk and death metal bands until he founded Insomnia Isterica (grindcore), which is his most active band, and MeVdA (experimental drone noise). The need to experiment with sounds and noises is what bounded the two members. They just sat down in a squat’s rehearsal room in Zurich and started to play together. In their first year of activity (May 2013 – May 2014) MM used the basic approach of drums + guitars to create the base of their sound which took a lot of inspiration from doom metal. Everything was enriched by the use of sounds and noises created by analogue synths and loop layers and occasionally by the use of treated vocals. With this set-up MM played four gigs supporting bands like Mombu (IT), Zolle (IT), Free Nelson Mandoomjazz (UK) and others and released a C90 tape on Attila’s label L’è Tütt Folklor Records. After this first year of activity, MM decided to leave the metal-driven base of their sound to concentrate on an electronic research and released another C90 tape using their alter egos MeVdA and Joel Gilardini. Right now MM are embarked in a ritual research of new landscapes and are planning new releases as well as looking for new gigs.